There may not be an academic job for you at the end of the tunnel. This blog post is part of a series called Is Academia Broken? This is the second in the series and it discusses the overabundance of PhDs compared to the number of available academic openings. The first blog post, on the perils of doing interdisciplinary research early in your career, can be found here. When I first started my PhD, I had one dream: to become a professor. I asked around and a lot of my fellow graduate students had the same motivation. They were pursuing a PhD to be professors. My personal reason was simple: I was attracted by the idea of being a scholar - pushing a discipline beyond the boundaries of what is known. I was also attracted by teaching. Ok, I was also attracted by the long summer breaks (which are actually largely a myth). Throughout my PhD, I did not even remotely consider a non-academic path. But I was lucky to have some computational skills, so there was always the possibility of a Plan B: a career in a large corporation, industry, or a startup (my research was in network analysis, natural language processing, text analytics, and bibliometrics). As some of you know, I ended up leaving academia after a very successful postdoc and creating the startup behind this blog post. But the question I would like to address today is: What were my chances of getting an academic job at the end of my postdoc? A scary infographic has been circulating for a while. 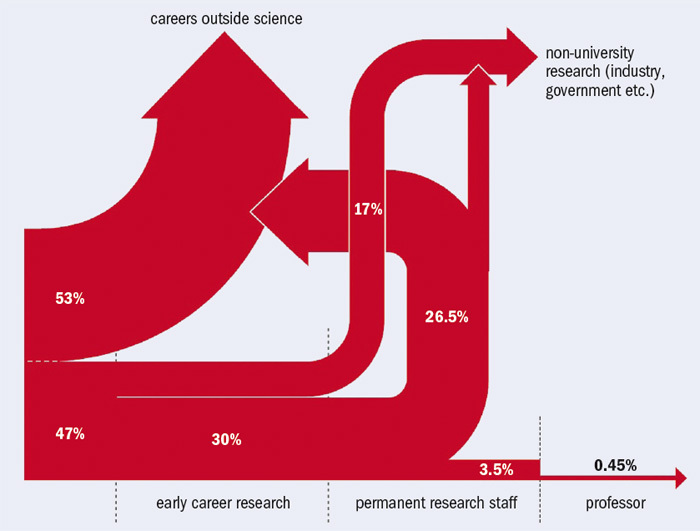 It shows that only 1 in 200 PhD students eventually ends up as tenured professors. This ratio (\(0.45\%\)) is incredibly low and endlessly debated. An NSF report (that uses 1999 data) states \(24\%\), so 1 in 4 graduates will get tenure: “since 1973, the percentage of recent PhD-holders hired into full-time faculty positions has been cut nearly in half, from 74 to 37 percent. The decline at research universities has been sharper, from 60 to 24 percent.” A paper published last year (Larson 2013) finds a lower overall ratio (\(12.8\%\)) based on a simple statistic, \(R_0\), defined as the mean number of new PhD’s a typical tenure-track faculty member graduates during his or her academic career. We show that the reproduction rate in academia is very high. For example, in engineering, a professor in the US graduates 7.8 new PhDs during his/her whole career on average, and only one of these graduates can replace the professor’s position. This implies that in a steady state, only 12.8% of PhD graduates can attain academic positions in the USA.